Ring in the New Year with Georgetown Art Attack! “All things share the same breath – the beast, the tree, the man, the air shares its spirit with all the life it supports.” – Chief Sealth, Suquamish Tribe and Dkhw’Duw’Absh chief. 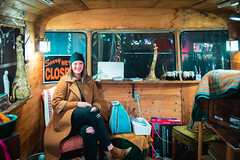 What better way to welcome the New Year than supporting your local artists in Georgetown with many new and long-loved galleries, shops, and studios? We know it’s still winter so if you are walking be sure to hop on the FREE Art Ride to experience our west end studios and galleries such as Equinox Studios, studio e and SANCA. Running every 15 minutes in a full circle so you don’t miss a thing! Fantagraphics Bookstore & Gallery The Life and Legend of Wallace Wood examines the illustrious career of one of midcentury America’s most influential and accomplished cartoonists opens on January 14. Editor Michael Catron discusses the work at 7:00 PM. All City Coffee will be featuring “Routine”, new works of Northwest artist and writer Starheadboy aka Dave Bloomfield. This show represents the idea of being in and out of comfort zones. The last couple of months Dave has been putting himself into uncomfortable situations on purpose to shock himself out of routine. Growth is in the unknown. The medium of this show is acrylic and collage on canvas and wood. Rainier Glass Studio invites you to become part of the glass art experience! Browse their gallery of NW artists unique blown glass art, with live demonstrations at 7pm during Art Attack. Bridge Productions presents MANY LANDS, Guest Curated by Ben Gannon. OPENING RECEPTION 14 JANUARY. Many Lands is a comprehensive exhibition of over 20 artists in which abstract and abstracted landscapes are situated together to represent the idea of “world building”, a contextual throughline between the speculative media of both contemporary art and science fiction/fantasy genre literature. The Alice Gallery Continuing an annual tradition, The Alice Gallery will exhibit this group showing in a large wunderkammer-style exhibition. Closing reception is January 14 during Georgetown Art Attack. Krab Jab Studios and Mainframe Frame Shop are proud to announce that Mainframe has joined Krab Jab Studio in Suite 150. Mainframe is the recent acquisition of Krab Jab’s Kyle Abernethy, Heather Morrison, and Julie Baroh and specializes in custom framing. Krab Jab will continue to exhibit original works of art, such as StephaniePui-Mun Law‘s Insectica series. Eight and Sand is proud to present the artwork of Catherine Lindquist. Catherine created an original work of art every day of 2016. She requested word promts from her social media followers then did a random pull every day. Quite a feat for any artist. These are smaller works mostly ink and watercolor and all will on be on display. Georgetown Trailer Park Mall is turning into shred town this Art Attack! Join us at 7pm while local, heavy/punk bands PissWand and The Great Goddamn play an outdoor set for all to enjoy. We’ll also throw you the warmth of a fire bin and some killer shopping throughout our 7 unique shops. Mark your calendars! Free, all ages. El Sirenito will feature a collection of acrylic paintings by full time teacher, artist and musician A. Mathison. With the recent remission of her oldest daughter’s cancer, her latest work has been focused “on the theme of living in and for each moment, with vibrancy and celebration.” Live music by local faves Michael Wohl and Tobias the Owl from 8:30PM-10:30PM. Base presents Jordan Spade, Solo Show: 120 Paintings. “You get the feeling that Jordan’s made thousands of paintings to get to this point, and that he has to do it every day. The kind of confidence, complexity and mayhem that exists in each work only results from that level of comfort. The painting themselves however, are quite the opposite of comforting… in the very best way possible.” – Shawn Carney, Senior Art Director at T Magazine. ONE NIGHT ONLY, Saturday January 14th, 2017. 6520 5th Ave S #122. The Georgetown Liquor Company will feature the art of Braden Duncan (Clockwork Art) for January in a selection of framed giclee prints featuring birds, bees & kittens. Braden is fascinated by the effects of transformative technologies on contemporary society, and she aims to take over the world with the strange and the adorable. Illumination Studio Would you like to see and feel the warmth of color? Come in to Illumination Studio #305, presenting Rostad and Ferrell, exploring the inner beauty of our neurological system through abstraction and vibrant color. Ferrell examines spatial and color field through abstraction and planes of color. Music by “DJ” Luscious Leopard Lips, who brings background music with a Theremin synthesizer and keyboards. Georgetown Music is featuring Acoustic Armageddon #31 featuring music by the best regional artists from 6-9 pm. All ages. Free. Join us for a memorable spring evening featuring art, music, live demonstrations and fun from one end to the other! 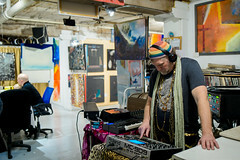 Our ever-expanding industrial, contemporary visual and performing arts/artists at over 40 locations, create an art walk experience as unique as Georgetown itself. Be sure to hop aboard the FREE Art Ride tour to visit many studio/gallery locations, including our west, such as studio e, SANCA and Equinox Studios! Fantagraphics Bookstore & Gallery is presenting a tribute to late Italian cartoonist Guido Crepax, featuring original art by contemporary cartoonists including David Lasky, Peter Kuper, Benjamin Marra, Roberta Gregory, George Pratt, Mark Wheatley, and more. The exhibition will also include reproductions from the Complete Crepax Volume 1 with a limited edition companion publication and other exclusive Crepax merchandise, translated into English for the first time. 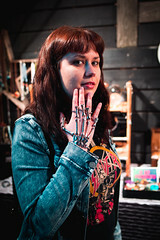 Bridge Productions is pleased to feature anamnesis, Ashleigh Rose Robb‘s, first solo exhibition in Seattle. Using markmaking as a gesture to record the passage of time, Ashleigh Robb’s compositions are the accumulation of simple lines and marks to build up form. The process of marking time varies, and as such, the materials used to do so are ever changing. Each line is a faint documentation which only appears up close, fading into white as you step further away, a haunting, philosophical body of work that carries forward its Minimalist lineage. All City Coffee “For your viewing pleasure”, the private art collection of Steve Withycombe, from primarily Seattle based artists, will be on display thru April. The Alice is featuring I Wasn’t Just Saying What You Wanted To Hear… an immersive video, sound exhibition that stages a conversation between five single-channel video artworks of Katherine Behar, Constance DeJong, Ellie Krakow, Jaeeun Lee and Elise Rasmussen. Miller School of Art will be showing ABSTRACTS, featuring Karyn Blasi and Elva Francis. Krab Jab Studiosexhibit “Dream Covers” is a group show in which artists have designed their dream book covers. Curated by art director/book designer Lauren Panepinto, with featured artists; Marc Scheff, Tran Nguyen, Rebecca Yanovskaya, Jeremy Wilson, Laurie Lee Brom, Brom, WylieBeckert, Iain McCaig, Dan Dos Santos, Dave Palumbo, Scott Fischer, Allen Williams, Chris Buzelli, Rovina Cai, Vanessa Lemen, Winona Nelson, Julie Bell, Boris Vallejo, Anthony Palumbo, and KimberlyKincaid. Artist in attendance will be Brom, Laurie Lee Brom, Jeremy Wilson, Marc Scheff and Lauren Panepinto with Curator Talk at 7:30 pm. Praxis Arts is pleased to showcase Leo Shallat. Leo Shallat is a visual artist born and raised in Seattle, Washington. Leo’s artistic practice draws inspiration from the culture of calligraphy and form line design as well as abstract painting. His work deconstructs letter forms to their bare elements, re-composing them to create abstract compositions that reflect an intuitive language of movement and flow. Eight and Sand is happy to present local artist, Rich M Stevens for the month of April. Rich uses mixed media materials including embroidery thread, cut paper, aluminum foil and resin to create intricate conceptual works housed in hand built shadow boxes. 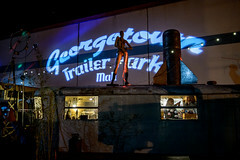 Georgetown Trailer Park Mall is hosting a trivia night! Come with 3 of your friends and impress us all with your infinite knowledge. Vie for gift cards from these local businesses: The Conservatory, Hitchcock Deli, Fonda la Catrina, and of course, us at the Trailer Park Mall! The game starts at 7pm sharp. Visit our Facebook page to RSVP. See you there, you smarty pants! The Conservatory Come join us this April 9th for the Georgetown Art Attack! The Conservatory will be hosting a live portraiture session with Tyler Jacobson, Cynthia Sheppard, Mark Winters, Sara Winters and Kieran Yanner. Coffee, beer and wine available. Georgetown Music Store is hosting Acoustic Armageddon. Monthly acoustic performances by regional artists and rotating visual art. Always free and all ages are welcome, every second Saturday during Art Attack, 6 – 9:30 pm. Neil Kelly presents Northwest Native Art by Walish Designs and artist Jiji Chartraw of the Makah Tribe. Native American drums and paddles featuring Northwest Tribal designs will be showcased in our Neil Kelly Showroom along with tastes of local tribal cuisine and wine. Wittman Estes Architecture will be hosting “Linescapes”, new work by Jeremy Prim. Linescapes is an exhibition of large scale, minimalist oil and wax paintings inspired by the Pacific coast.